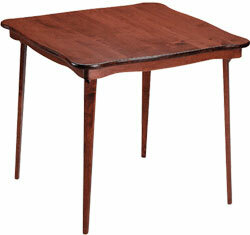 These Bridge Tables are available in your choice of Cherry, Fruitwood, or Oak Finish. They measure 29-1/8" tall by 32" wide, and fold quickly for easy storage (tables are only 3 inches deep when folded). 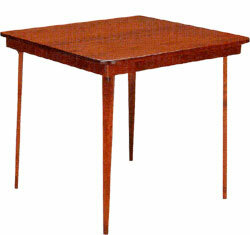 Two different Bridge Table styles are available, each weighing about 40 pounds. Our All Wood Bridge Table (352V) features a solid wood top with elegant curved sides shown alongside our more modern bridge table (456V) that features a solid wood top with straight sides for a sleek, modern look.